Lock in a great price for Reef Palms – rated 8.4 by recent guests! The staff was friendly and helpful with tours, finding our way around, car rental etc. Great value and a nice place to stay. The staff were friendly, the rooms were clean and comfortable. The staff had put an extra bed in the room for us. The hospitality was good and communication with the reception was great. The main office staff was super helpful in accommodating our needs. Very friendly! Friendly management. Good value for a large family room. Free parking on site. Comfortable beds. Air conditioner and fans. A swimming pool (even though I didn't get a chance to enjoy it). Free daily shuttle to town. This place was the best, nicest, largest place / value for the money that we found In our one month auatrailia trip through 5 cities. Highly recommended! The rooms were nice and clean and friendly staff members. Location is nice and quiet and close to beach. The night manager, Debbie, was so helpful with all our late night needs. Could not have been more accommodating. Ben and Tonia provided us with umbrellas and local information. Reasonable prices on the food and wine available at the Reef Palms. Having the complete kitchen saved me so much money by not having to eat outside the hotel. Pool area was beautiful; waterfall with gorgeous landscaping. Good breakfast. Great staff. Like staying with friends. The value was amazing. Employees where helpful in fixing problems with the room. Reef Palms This rating is a reflection of how the property compares to the industry standard when it comes to price, facilities and services available. It's based on a self-evaluation by the property. Use this rating to help choose your stay! One of our best sellers in Cairns! Located 650 feet from the Esplanade and offering free Wi-Fi, Reef Palms offers self-contained studio and apartments, plus a swimming pool with recreational spa, barbecue area and full laundry facilities. 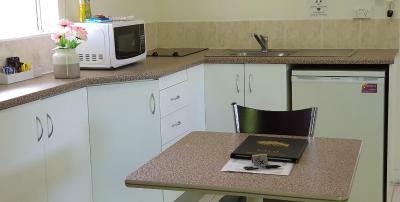 Reef Palms Resort is 2.5 mi from Cairns Airport and transfers to the airport are available. There is also a free shuttle service to Cairns shopping district via Cairns Base Hospital. When would you like to stay at Reef Palms? Spacious, air-conditioned studio. Also includes a balcony, a dining area and a lounge with a flat-screen TV. Guests enjoy free airport drop-off service (departing from hotel at 8 am, 9 am and 10 am daily). This spacious, air-conditioned studio features a corner spa tub for 2 guests. It also has a private balcony, lounge and dining area. This spacious, air-conditioned studio has a balcony or courtyard. There is a spacious lounge and dining area. This spacious, air-conditioned studio includes a private balcony, kitchenette, lounge and dining area. Please note that rates are based on 4 guests. This spacious, air-conditioned studio has a private balcony and a kitchenette. There is a disability friendly unit available, subject to availability. You can request your preferred bed configuration (subject to availability). Please note that rate is based on 3 guests. House Rules Reef Palms takes special requests – add in the next step! Reef Palms accepts these cards and reserves the right to temporarily hold an amount prior to arrival. Please inform Reef Palms of your expected arrival time in advance. You can use the Special Requests box when booking, or contact the property directly using the contact details in your confirmation. I was actually happy with my stay at Reef Palms. Very private. Very secure I was able to really relax knowing staff put our safety first and checked how we are going when we are walking around outside of our rooms. Very helpful and friendly staff. The staff were extremely nice and helpful. The studio had extra room for comfort. Breakfast was decent. They had a laundry which we needed. The shower and spa bath were very dirty, was not possible to have a clean bath. The cups in the cupboard were dirty. The room was reasonable for what I paid for. Comfortable for the most part. It was dirty. There was old food left in the microwave. There are issues between the owners and management and they are short staffed. Maybe the rooms have a scented perfume as it had a mouldy smell. The rooms were lovely. The highlight for me though was how lovely the gentleman at the front counter was. Very inviting and made us feel welcome. Rooms were not very clean. In-house decor quite outdated. Rooms are noisy. I could hear people walking in the room above me and has a crying child in the room next door that kept me awake. Bed was comfy. Shampoo etc. provided. I loved having little kitchen in my room. Shower was great! Managers were friendly but seems to have some problems they need to work out. Our room was up 2 flights of stairs and we had heavy luggage to haul. Also our room only had 2 spoons, no other eating utensils.